A few years ago, Oprah had a special on about bullying in schools. Watching that episode was, for me, a "lightbulb moment" (as the great Oprah would say). As I sat there, bawling my eyes out over these terribly tragic stories of students who were bullied in school, I thought to myself, there has to be *something* I can do. Anything. There is NO reason why children who are 10 or 11 (the age range of my students) should be driven to the point of killing themselves. I scoured the web, looked through all of my materials, even thought of some ideas on my own. But nothing I found fit what I wanted to accomplish. Everything I saw dealt with preventing the bully from acting. 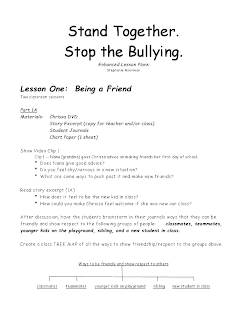 There was nothing I found that gave students strategies for coping with a bully going after them. The next day, I immediately paid a visit to our psychologist. As luck would have it, she had gotten a shipment from The American Girl company with some information on their new Girl of the Year, Crissa. 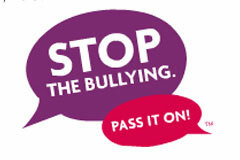 The entire program was an anti-bullying campaign geared towards what to do if you are being bullied. It was JUST what I was looking for. The problem? It was barebones. So I took it, beefed it up for my own needs, and began to teach my students about bullying and how to deal. Find the program worksheets here. (if you email them, they will send you the DVD to use as well. I highly recommend having the DVD) Below is the lesson plan that I used. What I did was take the existing plans American Girl had written, added Thinking Maps and some discussion points. I take no credit for the original plan, I just modified it to fit my own needs. :) The lessons took about 45 minutes each class session. I would teach one or two lessons a week. The difference in my students was amazing. They began reflecting on their own actions, standing up for themselves, and asserting themselves into other situations to help prevent others from being bullied. They began to see the "innocent" teasing and name calling as very serious actions. They realized that their own behavior could be seen as bullying, and they STOPPED! Students became equipped with strategies on how to not only control their own actions, but how to help themselves when someone else wasn't in control. By the end of the year, I had students coming up to me telling me about how they used to be bullied. How children in *my very own class* at the beginning of the year were harassing them, making them feel unwanted, making them hate school. But that after all of our lessons, after all of our work, those children were leaving the victims alone. Both victim and bully reflected on their actions and learned how to deal with them. It brings a tear to my eye just thinking about it. Great job, Stephanie; what a wonderful gift you've given your students! Kindness is a learned behavior and it's up to us to teach it. I am SUCH a fan of Michele Borba's work on empathy and turning cruelty into compassion - she's got TONS of stuff that sounds like it'd complement what you're doing. Oh, and I love the thinking map idea! Keep up the HEART work! Thank you Barbara. I will definitely have to look up Michele Borba's work. I am always looking for things that will help my 5th graders get through these rough years (and as we all know, the second semester of 5th grade is rough!!) Thank you for your kind words. This is so great! We've had a lot of issues going on in my school/classroom this year. I'm going to plan for this starting next month (or as soon as I can get the DVD). Thanks! Hi Stephanie. Just found your blog and am a new follower. Come check out my site. I teach 5th grade too! I am so glad that your lessons on bullying worked so well that it helped the bully and those being bullied. I bet the bullies felt so much better about themselves after they started making better choices to not bully others. Thanks for touching so many lives and teaching children to be respectful! Everyone needs this in their classroom. Bullying needs to stop at every age level. Great job putting it all together! !